Without doubt, churches have denominations and patterns of worship differ, but when you stumble on one, where weird activities are the order of the day and alcohol, animal sacrifices and biblical villains like Nebuchadnezzar, Ahab and even Satan are deified, then you’ve just encountered worship redefined. Tabitha Pearl writes. A Christian worship centre or church is a place where you expect everything but the absurd and the weird. But this was precisely what this reporter beheld few weeks back when she went snooping at “As God said, It Must Be Done, The temple of the Most High God,’ located in Oke-Aro in Ifo Local Government Area of Ogun State. A mere N100 bus ride from the popular Agege/Pen Cinema Bus-Stop, took this reporter to As God Said Street – the street is named after the church. A short commercial motorcycle ride took this reporter to the church’s doorstep. The temple is flanked on one side by what used to be a mosque and the other by a Celestial Church of Christ, which, strangely, wasn’t holding any service this Sunday. This reporter was however to soon discover during the nearly 10-hour-long service, that the mosque and the Celestial church had to evacuate their locations because of the new “Sheriff” in town. The first thing that catches your attention as you walk into the church premises, depending on your keenness of sight, would either be the rather heavy use of the colours red and white; or the slaughter slab on the far right corner, though carefully concealed by the gigantic red gate. Beside the slab this fateful Sunday was a black goat waiting to be slaughtered and served to worshippers. Makes some sense though. If worshippers have to stay in church up to 10 hours or more, it just might be normal to consider feeding them. Inside the temple, the love for red is even more pronounced. The floor has a fading red colour, which tells you it had originally been painted with glossy red paint; even the choir and a few members bear a touches of red on their dresses. No usher is seen ushering people in; there actually is no need for one, as the sitting arrangement is glaring enough, even to a first timer. Male worshippers sit to the right while female worshippers sit to the left. Another thing you cannot miss as you walk into the temple is the altar. It is divided into two sections: a very high one, probably the holy of holies, reserved for the Most High, should he come visiting; and then a lower one, possibly where the seer, fondly called Papa, preaches from, whenever he returns from a visit to the Most High, which he claims he does often. “I still communed with the Most High last month. I sit and discuss with Him often. I know his form. Who says we can’t see God?” he boasted amidst wild cheers from his followers. On the higher altar is a massive chair, the type you find in kings’ palaces. That’s probably where the Most High sits when he visits. On the lower altar is a replica of that same seat, possibly for the Papa. On the far left of the lower altar is a seat like the earlier ones, only smaller in size. This is where the wife of the seer sits during service, albeit only on the invitation of her husband. Right above the higher altar or holy of holies, is a line-up of some relics, the sort you’re only likely to find in a herbalist’s shrine. The most conspicuous of these would be an elaborate form of a skull, placed in the middle of two crossed bone-shaped pieces of woods – pretty much like the familiar skull and bones image, used to depict danger and death. There is also something like a big calabash, placed in the middle, leaving a first-timer wondering if this is a shine or a temple where God is worshipped. This announcement was followed by an excited cheer from the worshippers. The service, which was said to have begun at 8:30 am, ran for hours unending, with more than half the time spent singing and dancing, and – wait for this – spraying those perceived by the seer to have danced best with money. Interestingly, the children seemed to be more favoured in the money rain, above the adults. In order to be sure if this was the general mode of worship or just a one-off thing to commemorate the anniversary celebration, our reporter sought the opinion of a female congregant. After hours of singing, dancing and collecting contributions (tithe of the most high, answered prayer offering, temple offering, Caesar’s offering, offering of the earth altar – Exodus 20:24) from the congregants, this reporter was almost giving up on the hope of seeing the seer come out to deliver his sermon, when, to the relief of all members, he emerged at exactly 2:00pm – six whole hours into the service. After speaking elaborately about the 6th anniversary and outlining the achievements the church has accomplished in the last six months, part of which, according to him, includes having the street where the temple is located named after it, the evacuation of the mosque and celestial church in the neighbourhood, amongst others; he pronounced many blessings on the worshippers and began the day’s sermon. Quoting a passage in Titus, the seer asked the congregation to open their Bibles, so they could read together what the bible says about bishops. After searching the book of Titus without success, the seer’s reader came to the congregation’s rescue. The passage was actually in 1Timothy 3:1, not Titus. After the reading, he began another talk about Moses and Zippo rah. Soon, it was question time. After praying to the Most High to bless the young man and prosper his business, the seer called forward a lady whose face betrayed no emotion. It was hard to tell if she was happy, sad or just didn’t care. By virtue of marriage, she had just become a new member of the church and was given a special seat among the women who sat in front row. Soon, it was question time. The first question came from a boy, who was home for the long vacation. He wanted to know why the seer preaches that Jesus is not the saviour of the world and why they don’t pray in the name of Jesus. Indeed, this reporter had noticed all along that they weren’t praying in the name of Jesus, neither was the name mentioned throughout the service. In fact, songs that had the name in the name of Jesus were carefully edited and replaced with Saviour, Lord or Most High. The obviously dissatisfied questioner, was, however, soon silenced with a promise of scholarship for an academic session, for exhibiting great intelligence. The worshippers also went wild with joy at this pronouncement, and everyone soon forgot that the boy’s question wasn’t quite answered. The idea of becoming one of the ancestors pleased the worshippers and got them cheering again, loudly. The seer’s response was, “They lack knowledge. Nebuchadnezzar is my ancestors. Satan is my elder brother. See, that name Nebuchadnezzar is not a personality but a phenomenon. It means the wrath of God upon his children. But all those churches that pray against these names don’t understand. Is it possible to have the goodness of God and not have his wrath? That’s Nebuchadnezzar. My daughter, do you understand?” This was followed by a nod from the worshipper and a loud cheer from the congregation. At this point, this reporter burned with curiousity and wanted to ask several questions: “Can they call themselves Christians if they don’t believe in Jesus Christ? Why do they still perform animal sacrifices? Why is the altar divided into two sections and what do the relics on it symbolize? Why do men cover their head while praying? Is it true they drink alcohol during service and why? But it was another female member, who got the mic to ask her question. She began by introducing herself as a first-timer, but the seer counseled her not to call herself a first-timer. “Don’t call yourself a first-timer. There are no first-timers in the presence of the Most High. You are just a lost child, who has found her way home, and the Most High is always ready to receive you. Her question was, “Why did you direct us to read from the New Testament this morning, even though you said it’s all a lie?” That was to be the last question of the day, because the seer was obviously thrown off balance and events soon overtook the question time. “This lady you are seeing is a very intelligent lady;” the seer began. Pointing to the male section, he continued, “That’s her husband over there and it is whatever she says that happens in her marriage.” Soon, the question was left unanswered and a prayer and thanksgiving session began for the supposed couple, whom the seer said was believing God for the fruit of the womb. It turns out that this assertion was false, as this reporter had met the couple on their way out and they revealed that they were not even engaged, much less married, and neither had they need for children as the seer had declared. After praying for the couple, the seer asked for the drinks offered by the male worshipper to be brought in. 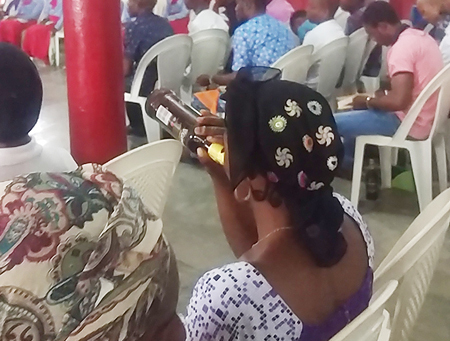 After taking two bottles himself, he opened one bottle each for the women occupying the special seat in front, after taking a swig from each bottle. Children and adults who do not take alcohol were served 7’UP. Amidst the drinking, one lady began staggering for nearly 15 minutes. An easy guess would be that it was the effect of the wine, but she soon steadied herself and requested for the mic. She had a testimony. According to her, her menstrual flow had ceased for about three months, but when she ate kolanut in church the previous Sunday, her menses began to flow again. The seer took time to explain that in the early days of his ministry, he used to serve his members the emblem used in other assemblies (unleavened bread and fruit of the vine) but after a while, the Most High warned him not to give the bread and fruit of the vine to his sons and daughter or else he will slay them. Now, their emblem for communion is kolanut and blended alligator pepper. As at 5;00pm when this reporter quietly left the temple, the service had yet ended. Kolanut was about to be served and they still awaited the meal that was being prepared with the goat that was slaughtered earlier on.